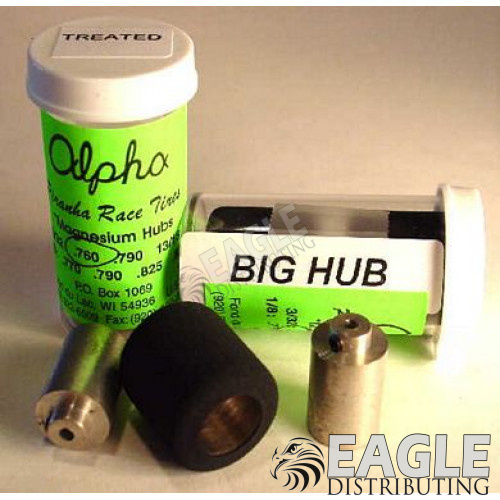 3/32x13/16 Big Hub Piranha Treated Alpha has a proprietary process of chemically treating the rubber to alter it's characteristics. The treated Piranha rubber is a bit firmer, and has a bit less grip. But it also is longer wearing and because it has less rolling resistance, is faster on the straight-aways and in the bankings. Try it if the regular Piranhas seem a bit too soft and grippy. The big hub Piranhas have a set screw boss area like the original Piranha tires, but have a larger diameter rim. This results in a lower rolling resistance for greater straightaway speed and less sidewall deflection, resulting in faster speeds on banking.